Well, here it is … the first test print of the Jenbach. As always, I cleaned it with acetone and added a couple of layers of Tamiya primer. Once it had fully dried, I did a quick test fit on the Bachmann chassis and bumped into my first problem. The printed body fits nice and snug over the chassis, the air tanks however are a bit too wide to slide over the side frames. So, I sawed them off and did another test fitting. As you can see from the image above it fits quite nice, but there are some issues with the 3D-print itself. First of all, the lower sides of the cabin are bent quite a bit. It’s a known issue with FUD from Shapeways, caused by the fact that they are thin and not supported. This can easily be corrected by making them a bit thicker, so I will change that. The second issue however is a bit more serious. I am also not quite sure if I hit the shape of the Jenbach with my 3D-model, as the hood seems to be a bit too wide and slightly too high. Furthermore, I would love to have an open hood, just as the originals had in the warm and sticky Queensland climate. 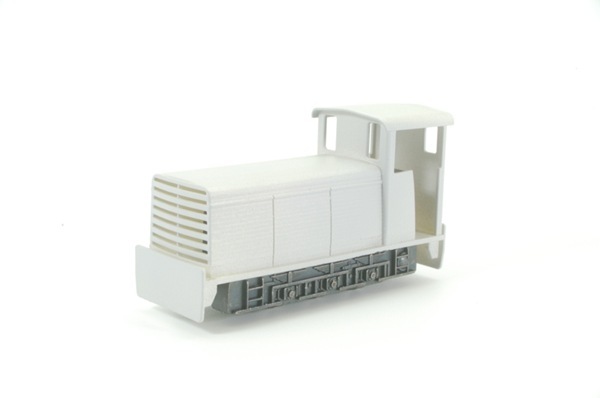 Fortunately, as mentioned in my previous post, I already found an alternative for the Bachmann chassis. It’s the chassis of a small 0-6-0 diesel engine made by Fleischmann. As as you can see from the spare parts leaflet, it should be possible to model an open hood … at least at the front of the Jenbach. I am not quite sure if the engine is smaller than the one in the Bachmann chassis, but I should be able to find out fairly soon … just found a second-hand one on the web. Will let you know as soon as it arrives. 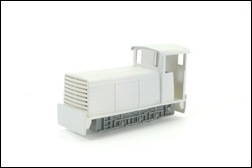 This entry was posted in 3D-printing, Rolling Stock by Koala Creek. Bookmark the permalink.